I like web tool cause they are simple, easy to use without software. I also introduced many useful web tools here. This time I like introduce an uncompress tool that helps you uncompress your compress files without any software. 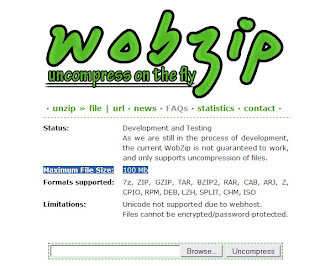 Wobzip offers a web service that lets you upload your compress file and uncompress online. It is really simple, just use browse bar pick your compress file, and click "Uncompress". After that, it will scan file for check virus, uncompress file, gives you a link for download. It supports many formats, such as 7z, ZIP, GZIP, TAR, BZIP2, RAR, CAB, ARJ, Z, CPIO, RPM, DEB, LZH, SPLIT, CHM, ISO. Maximum File Size allows 100 Mb. If you do not have any uncompress software that should be useful. Update: This service is down (05/16/2009).